Comparison of the DSLR Canon EOS 20D and the DSRL Canon 10D in the field of astronomy and faint detection flux. Only the optoelectronic point of view is analysed. The two DSLR are measured during the same run (16 November 2004). The image are acquired in the RAW format. 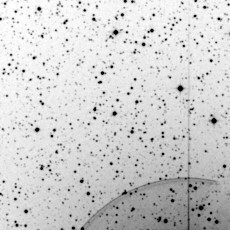 The telescope used for star images is a refractor Takahashi FSQ-106 (106 mm aperture - 530 mm focal length - a razor blade fluorite instrument). The sky is very polluted (suburban condition). The images are processed and analysed with Iris software. The signification of ADU is "Analog Digital Unit" i.e. 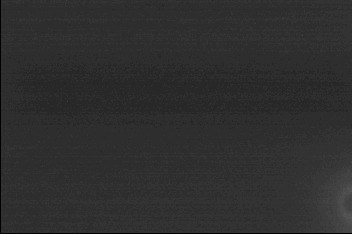 the "digital count" at the output of the camera. 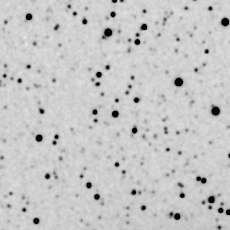 Below, crops of the Gamma Cas star field (only a very small part of the full frame is showed at the original scale). No white balance applied ("natural" color of the RAW images). Offset and thermal signal is subtracted. The flat-field correction is not realized. The visualisation parameters are the same for the two DSLR. Comment: the ESO10D image is clearly more noisy. But, for an objective comparison, it is important to consider the relative sensitivity of the two camera. 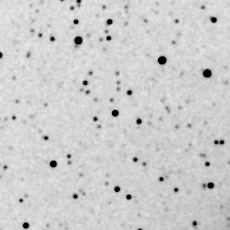 Measure of the signal on the sky background, on defocused stars and on white uniform screen (sun light) shows a sensitivity gain of 1.41 for the 10D comparatively to the 20D. So, the photon noise in the sky background of 10D is significantly increased. The difference aspect of the 10D and 20D is confirmed in the documents below. 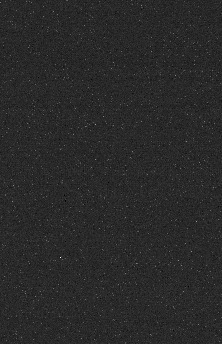 The RGB channel are equaly added for produce a black & white image. The 10D image is more boosted (see halo around Gamma Cas) but also more noisy. Comment: The resolution gain of the EOS 20D is evident (remember, pixel size of 6.4 microns and 7.4 microns respectively for the 20D and the 10D). 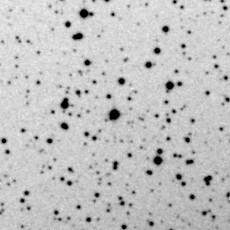 The detectivity is also sligthly better for the EOS 20D, but for a part, because the increased resolution (better sampling of the stars). EOS 10D bias image (or offset image). Median stack of 6 offset EOS 10D images. The document give information about the fixed pattern structure. Subtraction of an offset image and of the fixed pattern structure for the EOS 10D. 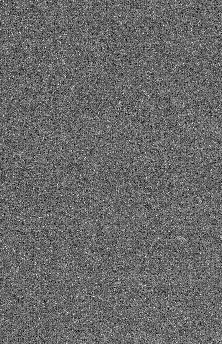 It is the true readout noise "image" of the camera. EOS 20D bias image (or offset image). Median stack of 6 offset EOS 20D images. Subtraction of an offset image and of the fixed pattern structure for the EOS 20D. 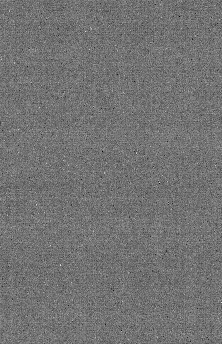 It is the true readout noise "image" of the camera. The mean level of the bias is of 131 ADU. The mean level of the bias is of 128 ADU. Comment: The noise is very gaussian for the two DSLR (a good new!). The measured RMS noise for the EOS 10D bias is 6.2 ADU (ISO 400). 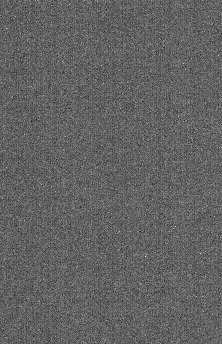 The measured RMS noise for the EOS 20D bias is 2.4 ADU (ISO 400). 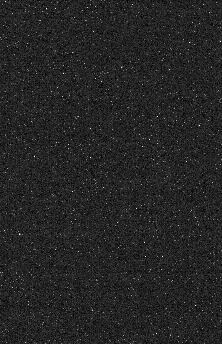 The apparent noise of the 20D is significantly lower (evident on the images). But, the electronic gain is not similar (transfer curve method evaluation on flat-field images): 2.4 electrons/ADU for the EOS 10D and 3.1 electrons/ADU. Finally the true readout RMS noise is 6.2 x 2.4 = 14.9 electrons for the EOS 10D and 2.4 x 3.1 = 7.4 electrons for the EOS 20D. The intrinsic noise of the EOS 20D is 14.9 / 7.4 = 2 time lower comparatively to the EOS 10D. It is a major difference between the two cameras and the EOS 20D is here the winner (improved CMOS detector and/or video electronic chain). 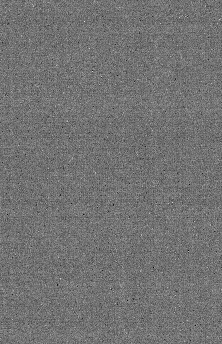 For the two DSLR the fixed pattern amplitude in the bias is very low: 1 pixel RMS. The thermal signal of the CMOS detector for the two cameras is definitively very small... and the performance is in progress for the EOS 20D! The dark signal is estimated 3 times lower for the 20D in ADU. If we take into account the gain difference of the two cameras, the thermal signal (in electron unit) is nearly two time lower for the EOS 20D comparatively to the EOS 10D. 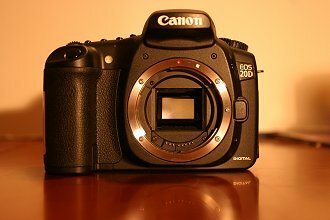 The EOS 20D is an improved version of the EOS 10D. The major gain is a lower intrinsic electronic noise. This progress compense the lower sensitivity induced by the smaller pixel size. The difference between EOS10D and EOS20D is not considerable - the EOS 10D remains largely a very powerful and competitive camera today. Dark signal of the 20D is reduced to 50% (for the tested model). The resolution gain of EOS 20D will be notable only if it is possible to use high qualities optics (for example short focal length fluorine refractor or very good telephoto lens like the Canon EF 400 mm L). 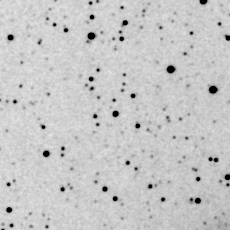 The same field is observed with the DSLR Canon EOS 10D / 20D, Nikon D70 and the CCD camera Audine. The cumulative exposure time is identical. The telescope is a Takahashi refractor FSQ-106 (4-inch aperture). 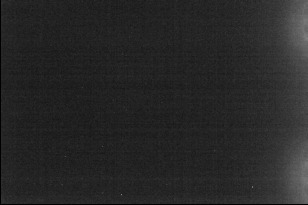 Images taken the 23 Nov. 2004 (presence of a large moon and polluted sky condition). For the DSRL images, the ISO setup is 400. A simple linear interpolation is used for convert the CFA matrix to a RGB image. The black and white images are computed by adding the Red, Green and Bleue channel. 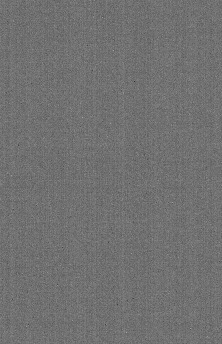 The IR-cut (and antialiasing) filter of the Nikon D70 is removed (click here for details). Note the potential excess of IR signal (a superior number of red and IR photons are captured). The MODE 3 of the D70 is used ("true" RAW images). 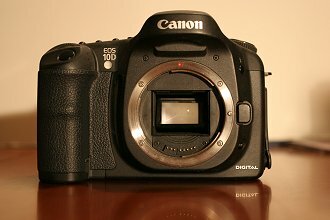 The EOS 10D image is unfortunately very slightly out of focus (not critical for signal evaluation). The AUDINE camera include a Peltier cooled CCD Kodak KAF-0402ME (one of the better CCD detector available for amateurs). The pixel size of KAF-402ME is 9 microns. The performance of AUDINE camera is very nearly similar to a SBIG ST7ME camera for example. The images are scaled to the EOS 20D grid. 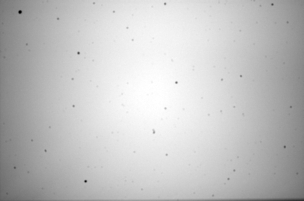 The detectivity estimation is biased by the difference of spectral response of the cameras (pixel RGB filters for 10D / 20D, pixel RGB filters for the D70 but a clear IR transmission, unfiltered full Si spectral range for the AUDINE), but the comparison is representative and significant if the goal is only the detection of the faintest objects and not a phometric use. Exposure : 3 x 120 sec. = 360 sec. Exposure : 12 x 30 sec. = 360 sec. 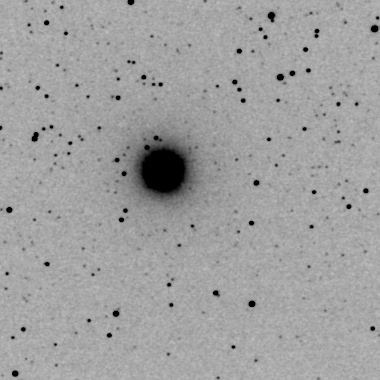 Below, the localization of the field on a POSS2 image (Palomar Observatory Sky Survey - Red plate). The central star is GSC 4017:531 at AD 0H56M13.0s, DEC +60°34'44" (M=11.6). 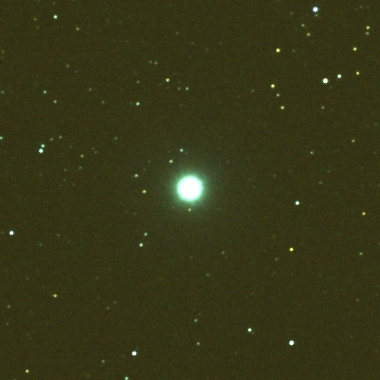 The measure is characteristic for a "mean" star spectral type (G type ?). 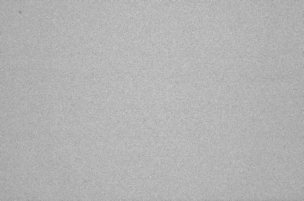 In most general case, for deep-sky imagery the dominant noise come from the background sky (it is particularly true during this test - moon light + city light). So, for compute the limit magnitude we are not concerned with the intrinsic detector noise (the Read Output Noise). where is the system transmittance, t is the total exposure time, D is the telescope diameter, p is the pixel size and Q is the quantum efficiency (the relative value of Q can be used). For example, for the same instrument, the same sky and the same exposure, the Audine camera can detect stars fainter by 0.66 magnitude compared to the EOS 10D. 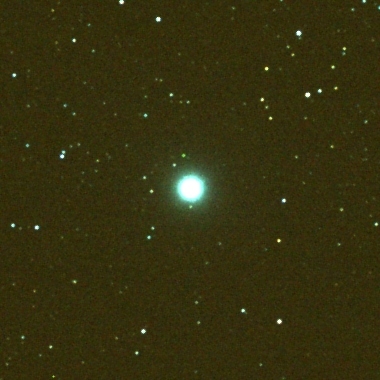 The EOS 10D and EOS 20D give very similar results, confirmed by the aspect of the deep-sky images. The unfiltered Nikon D70 is attractive for faint detection, and we have also a true "black&white" camera for wavelength upper to 800 nanometers (RGB filters are transparent in infrared). The unmodified D70 is not specifically tested during this run but its response is equivalent to the Canon EOS 10D (click here for details). Complement : How to compute the photon transfer curve and the electronic gain ? Note: The procedure is illustrated by the Iris software commands but other software have similar function. (2) Subtract the bias of each image (normally constant - the mean level in the darkness). For example OFFSET -45, if the mean bias level is of 45 ADU. (4) Evaluate the median intensity of the images in the central region: Select the region, Contextual menu, Statistics command and Median result. Use an area if 50x50 pixels for exemples. Suppose the result S = 1433 ADU. (6) Evaluate the standard deviation of the central region: Select the region, Contextual menu, Statistics command and Sigma result. Suppose the result 29.03 ADU. (7) Divide the standard deviation by 1.414 (i.e. ), this give the noise of one image. Here 29.02 / 1.414 = 20.53. (8) Compute the variance V = 20.532 = 421. 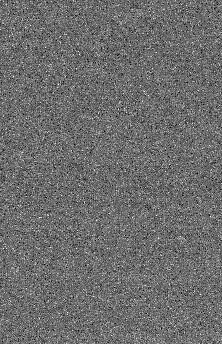 The final electronic gain of the system is and the readout noise is (but, for the readout noise it is preferable to measure directly the deviation on a bias image - the result is more precise). The transfer curve is also informative about linearity of the electronic chain.